Sunny, warm weather and a sea of smiling faces greeted attendees of The Sarasota Film Festival as the southwestern Florida event wrapped its tenth anniversary and continues to grow in prominence as an important part of the film festival circuit. With screenings of over 105 features, tributes to film industry talent, as well as an impressive twelve film retrospective of actress and filmmaker Liv Ullmann‘s collaborations with the late great Ingmar Bergman, Sarasota impresses strongly as an event that caters beyond that of merely a regional festival for a city of 55,000. Sarasota’s dramatic competition lineup also had an emphasis on World Cinema, including “Mongol“, which was nominated for the 2007 Academy Award for Best Foreign Film, Fatih Akin‘s follow-up to “Head On,” “The Edge of Heaven,” as well as selections from Romania, Norway, Rwanda, and France. Submarine Entertainment‘s Josh Braun, who heard about the buzz regarding “The Pleasure of Being Robbed” after its premiere at South by Southwest, signed on to represent any future sales of the film a few days before Sarasota begin. With Braun’s recent success selling The Duplass Brother’s equally indie-spirited low-budget feature “Baghead” to Sony Pictures Classics at Sundance earlier this year, it will be interesting to follow “The Pleasure of Being Robbed” and its future. Another sad film about abuse towards the innocent and the search for justice, “They Turned Our Desert Into Fire,” follows war photographer Mark Breckle, who has covered numerous genocides around the globe, as he journeys to Washington, DC to present his Darfur photos to Congress. The film won the International Jury Prize for Best Documentary at the Sao Paulo International Film Festival in Brazil with Sarasota being its US premiere. 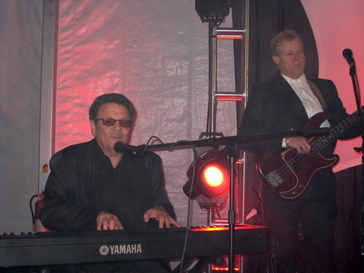 Songwriter Dennis Lambert (and subject of the documentary “Of All The Things”) performs at the Late Night Party at the 2008 Sarasota Film Festival. Photo by James Israel/indieWIRE. Yung Chang‘s “Up The Yangtze” also offered a sad look at a peasant family whose life is going to be literally swallowed up after completion of the massive Three Gorges Dam in China, which will result in the mighty Yangtze River being subverted and its water level raised to build the world’s largest hydroelectric power station. Watching a peasant farmer struggle to carry what little ramshackle belongings he has to escape the inevitable “progress” is perhaps the most powerful image in the film. On a fun yet still serious side, Helen Hood Scheer‘s documentary “Jump!” takes a look at the little known world of competitive jump roping and the incredible athleticism and discipline required as children and young adults prepare for a world competition featuring jumpers from all around the world. The festival not only exhibited films from around the world this year but also showed off Steven Schachter‘s “The Deal“, which was born in Sarasota after the community got involved with the project back in 2006. Sarasota Film Festival board member Keri Nakamoto and the Sarasota Film Festival executive director, Jody Kielbasa served as producers on the film. Starring William H. Macy and and Meg Ryan,”The Deal” kicked off the festival as its opening night film and was also touted at a unique fundraising party organized by Keri Nakamoto to connect film talent with potential investors and tout their new collaboration, kame jiro films. Producer Ted Hope, director and actor Stanley Tucci and Steve Buscemi worked the crowd at the intimate affair that was held at Michael’s Wine Cellar. The event also served as a good warmup for “Night of 1,000 Stars,” where locals and visitors alike enjoyed a decadent mix of food and music at Michael’s on East. Food highlights included a fun array of sugary concoctions, including Vodka snow cones, a table piled high with jelly beans, M&M’s and other candies, and a server expertly whipping up Smores with a butane torch. Melted marshmallows and chocolate were also on the menu at the Thursday night event, Cabana Culture, which was a the highlight of the festival parties and held on the gorgeous powdery white beach of the Siesta Keys where attendees traded in their shoes for flip-flops while partaking in yummy appetizers, including a literal boatload of shrimp while waiting for a gorgeous night as the sun descended over the Gulf Coast for a lovely sunset. The festival wrapped up on Saturday night with a 10th Anniversary Ball which featured tributes to the careers of producer Ted Hope, filmmaker Stanley Tucci and actress Charlize Theron. After the snazzy black tie event, which is a highlight of the festival and in the Sarasota community in general, the Late Night Party kicked off with a performance by Dennis Lambert, who was a hit songwriter in the ’70s and ’80s and the man behind “Rhinestone Cowboy” and “Nightshift.” Lambert’s story is told in “Of All The Things,” a documentary by his son Jody Lambert which also won the Audience Award at Sarasota for best documentary feature. Independent Visions Competition Award – “The Pleasure of Being Robbed” by Joshua Safdie. Bombay Sapphire Audience Award for Best Short Film – “La Corona” by Amanda Micheli and Isabel Vega.